Usually i am the first or second to blog about it. Today, two other fanatic Skypers warned me that I should blog. I was aware, but too busy … 15 million concurrent users online today, congratulations Skype and its users! So, what is exceptional about this? 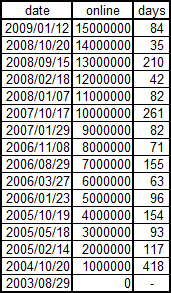 Not that million added of course, not the 84 days it took to reach the 15 million, but it could be that we add another million before the end of June. In that case it will be the first time in Skype history that we cross 4 times a million milestone in one Northern Hemisphere “school year”. 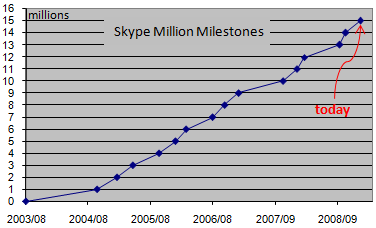 Anyway, Skype shows a quite strong growth the last months! We actually reached 15.47 million yesterday. At this rate, we'll reach 16 million in a week! Thanks for the comment Skypie. Believe it or not, but i made the same comment to my son yesterday. That some 3 G cell phone users have activated Skype, ok, but this is still a minority in the majority of the countries. Don't forget that Skype is used quite a lot in emerging countries where it is a cheaper solution for phone calls than traditional phone companies. Your 3G analysis is right, but only for rich countries, and even there i doubt about the proportion of Skype users who use nowadays G, but this will change fast of course. In the long run they will have indeed to find ways to generate income out of other sources than pure "calling minutes", and they already are doing this! we are going to reach 16 million today. we almost got there yesterday but it was a holiday in the US. Today Skype sets a new record. Any idea where i can find those facts and figures ? @Skypie: when i arrived home an hour ago, i looked at the numbers, and i was surprised that you you were wrong: quite a lot lower than the 16 million, and then i remembered! Obama! A lot of people all over the world are in front of televisions instead of in front of computers! Skype doesn't publish detailed financial information. I guess the % of skype users with credit is less than 20%, my guess is 10%, but this is a guess! last week obama. this week chinese new year. next week we will not only reach 16m, we will beat it by several hundred thousand. OK Estonia, you are probably right.